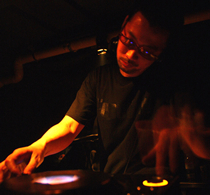 DJ / a programmer of KYOTO JAZZ MASSIVE--- He is also an owner of "ESPECIAL RECORDS" and running a record shop in Minamisenba, Osaka. Since he established it, he has been always in the spotlight with regards to some wonderful tracks which he released until now like SLEEP WALKER, HAJIME YOSHIZAWA, BAKURA and so on. And also he is evaluated highly as a DJ tour organizer. He has invited JAZZANOVA, RAINER TRUBY, BUGZ IN THE ATTIC, DOMU, RESTRESS SOUL, PATRICK FORGE and so on and succeeded every tour. His latest work is a DJ mix CD "Inspiration" which is a collaboration with Ryota Nozaki(Jazztronik), Yukihiro Fukutomi and Kenji Sakajiri(ESPECIAL RECORDS). This will be released in this coming October 2004. ・ "FREEDOM TIME" @NOON. Osaka- Irregular fourth Saturday. Sakura bldg. 1F, 4-9-2, Minami-senba, Chuo-ku, Osaka 542-0081 Japan.